When the time comes to replace old linoleum or vinyl flooring, you have two options: remove the old flooring or install a new flooring material over it. If the conditions are right, titling over the old flooring can be the easier and quicker approach. It's also safer to keep the old stuff in place if it might contain asbestos. Starting with a layer of cementboard over the old flooring is the standard, but there are also some newer options for prepping the old surface for new tile. There are two common deal-breakers in this project. The first is loose old flooring. Your new floor will be stuck to the old, so if the old doesn't have a good grip on the subfloor below your new flooring won't either. If the old floor is tile and has a few loose pieces, you can re-adhere them or peel them up and fill the voids with thinset tile adhesive, but if large areas are loose or if the flooring is sheet-style, not tile, and has any loose areas, forget the idea of tiling over it; take it all up and start over. The other deal-breaker is padded vinyl flooring. Ceramic tile tolerates very little movement and any cushion in the flooring below can lead to cracks or loose tiles. Linoleum or vinyl flooring on a wood-frame floor is most likely installed over standard wood subflooring, which might be 3/4-inch-thick lumber boards, plywood, oriented strandboard or particleboard. All of these subfloor materials need a bit more thickness and stiffness to ensure a successful tile installation. The industry standard is a minimum subfloor thickness of 1 1/8 inches--not counting the lino or vinyl--if the floor joists are spaced at 16 inches; if the joists are spaced every 24 inches, the subfloor thickness should be at least 1 1/2 inches. The standard solution in this case is to install a layer of cementboard over the old flooring. If your subfloor is 3/4 inch thick, use 3/8-inch or thicker cementboard; for 5/8-inch subflooring use 1/2-inch cementboard to achieve the minimum recommended thickness. Follow the manufacturer's directions for installing the cementboard. The standard application involves gluing the panels down with thinset and fastening them with screws. Fill the seams with more thinset and cementboard joint tape before laying the tile. If your wood subfloor is already thick and stiff enough for tile, or if your subfloor is a sound concrete slab, you have a few other options for getting the surface ready for ceramic tile. The first is to install the tile right over the old flooring, using a latex-modified thinset adhesive designed to adhere to linoleum and vinyl. For best results, the old surface should be roughened up by sanding to provide some "tooth" for the thinset to bond with. Mix the latex-modified thinset according to the manufacturer's instructions, and spread over the linoleum with a 1/4-inch notched trowel. Do not sand linoleum or vinyl that was installed prior to the 1990s. 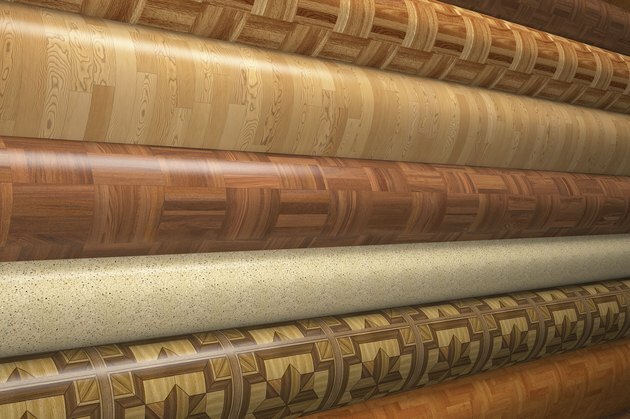 Through the 1980s, asbestos--a cancer-causing mineral material--was used in many types of vinyl flooring and some linoleum derivatives, as well as flooring adhesives. Hire a professional to test the flooring for asbestos if you are unsure when it was manufactured. The next option for tile-ready subfloors is a rolled fiberglass mat product that glues down to the lino or vinyl with a special adhesive. The new tile installs on top of the fiberglass surface with standard thinset. Advantages of this system include a strong bond between the mat and the vinyl, and there's no need to sand the old floor. Once the mat is down you spread on a thin layer of thinset and let it dry. From there the tile installation is completely standard. Many tilesetters like to install a decoupling membrane between concrete subfloors and new ceramic tile. This helps protect the tile from new cracks that form in the concrete and from old cracks that may shift or widen over time. A polyethylene underlayment is an effective decoupler and it can be installed over old lino or vinyl. The underlayment is adhered to the old flooring with thinset, then it gets a smooth layer of thinset on top. Once that's dry you install the ceramic tile using standard technique.